Who May Attend Chamber Events? Chamber events are a valuable membership benefit. Not yet a Chamber member, but want to check out a few events before joining? Great! GLMV events are always open to non member guests. Guests may attend up to 3 GLMV events to network with the members and learn more about the Chamber before joining. Non-member fees will apply, when applicable. 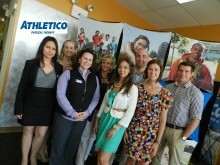 All representatives from member companies may also attend Chamber events and enjoy member benefits. The GLMV Chamber holds informal social networking opportunities monthly at member eateries & businesses. Regular Monthly Mixers are held 4th Tuesdays, 5 - 7 pm at various locations. These mixers are free with appetizers and cash bar. Members may also schedule mixers at their location throughout the month. Mixers are an ideal way to showcase a business, mix ‘n mingle, and network face-to-face with other members. Many mixers include facility tours, brief presentations, raffles, refreshments, beverage, raffles, and door prizes. People prefer to do business with those they know, so bring plenty of business cards and a guest or two. There is no fee to attend a mixer and guests are welcome. The GLMV Chamber helps celebrate your special events, such as grand openings, anniversary, reopening or other celebrations. Ribbon cuttings are an ideal opportunity to introduce your business to the community, and provide great photo and visibility opportunities. On behalf of the Chamber, we can coordinate your event with village dignitaries, help you promote, attend, cut the ribbon, provide meet 'n greet, and take digital photos. Chamber hosted events at member locations are designed to put your business in touch with other professionals, Breakfasts and luncheons feature high-profile speaker presentations on a variety of timely and interesting business topics, and ample networking opportunities. Sponsorship offers additional visibility. Specialty luncheons include Mayor's Luncheon, Legislative Panel, Economic Outlook, and festive Holiday Party. All members are encouraged to attend FREE quarterly orientations to learn more about the Chamber and how to get involved, and make new contacts. Workshops, seminars and free Business Corner Munch ‘n Learn programs presented at area libraries and other locations educate GLMV business professionals on a variety of timely and useful topics, such as sales, marketing, social media, financial, health care, customer service, and other topics. Educational events may also showcase area businesses, resources and services among a variety of industries. Do you have a success story, expertise, tips and ideas you would like to share with other business professionals? Would you like to offer a dynamic presentation to a Chamber audience? If so, you may be a good speaker candidate. If you would like to be considered for a speaking opportunity, click here for Speaker Application. FREE Group open to all Chamber members. Business introductions, presentation, exchange leads and referrals. 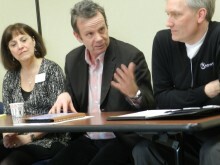 This active group also hosts periodic networking events. 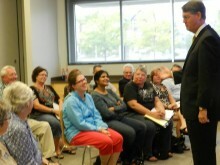 Meets first and third Friday, 7:30-9:00 am at Holiday Inn Express in Vernon Hills. Includes Breakfast by Corner Bakery Cafe - VH. Join the area’s most influential business people for presentations, networking, luncheon & camaraderie at a long-standing, proven and effective networking luncheon. Watch for upcoming dates. Area young professionals in Lake County meet for monthly Power Hour, informal networking, camaraderie, fun at area establishments. Annual Dinner 'Starry Starry Night' Elegant dinner features member recognition and awards, board installation, presentations, entertainment, raffles – an evening to remember. Spring Business-To-Consumer EXPO (Extreme Block Party) Showcase your business to large consumer audience with exhibits, demos, raffles, contests, prizes and sponsorship opportunities at this popular community event. Expo is free to attend. Business-To-Business EXPO. Held periodically, EXPO features Keynote Speaker and platform to showcase products, services and resources to business community. Golf Outing - Enjoy golf, food, beverage, networking, contests, prizes, raffles, sponsorship opportunities, and camaraderie at the ultimate outing of the season held at the private Hawthorn Woods Country Club. The Chamber participates in various community events and programs during the year, including the American Cancer Society GLMV Relay for Life, helping to raise awareness and funds for cancer research. Through sponsorship and/or hosting events, advertising in Chamber publications, displaying promotional materials at the Chamber, referrals, annual trade shows and more, the Chamber provides many vehicles for businesses to market and increase visibility and exposure. Chamber members are encouraged to participate in events to further market their business. Chamber members receive free business listings on our website and in annual publications. We work and partner with local media to promote Chamber members, events and activities, and to increase our visibility and grow our Chamber. GLMV maintains active presence on social media sites such as Facebook, LinkedIn, You Tube, where businesses can connect and interact 24/7. Have an event or special offer to promote? The Chamber will send and distribute an individual e-blast flyer that you create for your business to our complete distribution list. For more information click here. Chamber members s are kept abreast of the latest Chamber and community news and activities via website, electronic news blasts, social media, flyer distribution, meetings and announcements, and local media. The Chamber also publishes an annual Community guide and other community publications. Sponsorship and advertising opportunities are available in all Chamber print and online communications, as well as local media. Visit the GLMV Chamber website often to learn what’s new at the Chamber. The site features Member Directory with business profile and and direct link to member websites. Members may also post events, hot deals, (Special promotions), news releases, photos, videos, and purchase banner ads, RSVP for events, and apply for membership online. The Chamber provides business referrals upon request to Chamber members first. 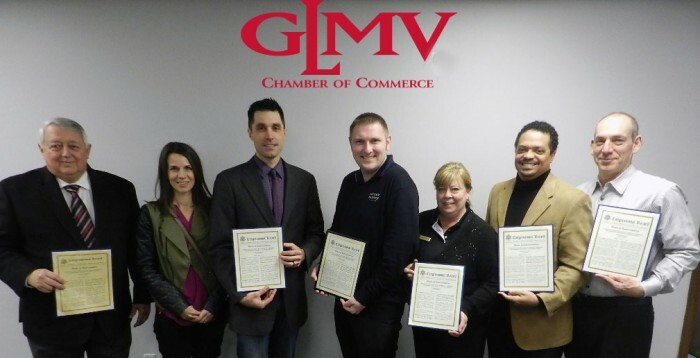 Door decals and membership certificate that can be framed identify Chamber members as part of the GLMV business community.